Start as a small group and rapidly expand in the fantasy setting, it becomes very political in the setting as territory's change hands. There is a large cast of characters with a few dying off as the story progresses, which it does very fast. Seems to be a similar set-up, where a male/female duo get together to found a separate "nation" and accomplish great things. Grancrest Senki seems to be more Medieval based, while Utawarerumono is more Fantasy/Isekai, and both involve some type of overarching plot or factor that provides the base for their goals and/or desires. From nothing to political power. Both involving wars lords and action also with comedy in it. Both a MC which was wondering and trying to save his own land, and was made into a lord and magic. -There is Magic -Both Male MC wanna protect there Land/Home -There are War's -I feel like strategy plays a big role in both Anime. 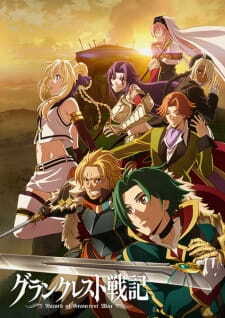 Overall it is really similar and if you like "Grancrest Senki" you'll probably like "Madan nou Ou to Vanadis" too. You see in both: - female main character closes a contract with male main character - romance set in a non-modern era - female main character takes care of the strategy towards their goal of creating a better world - magic - war - very similar feel I was surprised not to see this in the top recommendations here. I automatically thought of Grancest Senki while watching Maoyuu, they have a very very similar feel. Both anime have an exposition with a mature boy-meets-girl trope following which the two characters use unorthodox methods to attempt to create a world that one of the characters envisioned. Both anime feature a world at war between two major parties and the political undertones those conflicts have. Seems to be a very similar premise, where a charismatic, but weak individual gathers up other, stronger or more knowledgeable people to help accomplish their vision and goals that may go against the grain of the current prevailing forces. There are also similarities in that the main character's allies are potentially somewhat manipulative. Although their premises and plot progression are completely different, they're both stories set in a medieval fantasy setting filled with armies battling each other, lots of violence and death, super powers or magic, romance between two enemies and political overtones. So if you liked one you would probably like the other. With that said, I have to make clear that Grancrest Senki is more focused on politics so it might get a little harder to get into. If you happened to watch and like both of these series, I suggest you watch Windaria. Both were set in a certain time period where warring factions fight for supremacy, except one was set in some quasi european setting while the other is more on the oriental east, one was more of supernatural and fantasy while the other has an odd kind of sci-fi in it. In both fantasy anime we have a heroine from high status met our hero protagonist blessed with great power from low status. It involves wars where the principle of peace is at stake, and where one strives to get over the other in order to achieve victory. Both are set in a medieval fantasy world that is plagued by some sort of malevolent force that brings about war on a grand scale. In addition, both male lead characters have the ability to gain magic power from others. Both are about war and wandering people who form up party. Far better character drama, easier to track the plot. No one is an overpowered demigod, nor does anyone really become a badass without earning it. For someone who likes fantasy adventures that involve magic and warring kingdoms both anime are a good choice. For people that aren't to fond of this genre, they may still grow on you, because of some characters, the mature themes or the story twists. But be warned they are also simular in their bad points like pasting and to many characters. Both have the same plot where it involves a mage and adventurer relationship, except one has a bit of a serious side while the other has a comedy side.